It comes after BP’s announcement last week that it would invest £7.5 million (about US$10 million) over five years in the British Museum, Royal Opera House, Royal Shakespeare Company and National Portrait Gallery. The letter, organized by Art Not Oil and published in the Times, says BP uses arts sponsorship to develop its interests in oil extraction, which must be reduced to tackle climate change. Among the letter’s 214 signatories is the Oscar-winning actor Mark Rylance, who was previously artistic director of Shakespeare’s Globe theatre and played the lead in Steven Spielberg’s the BFG. It is also signed by actor Ezra Miller, artist Conrad Atkinson, composer Matthew Herbert, author Naomi Klein and environmentalist Jonathon Porritt. The letter says: “We cannot afford another five years of BP-branded culture. We believe museums, theatres and galleries are public institutions that must play a positive role in taking urgent climate change action and defending human rights. The letter adds that it has become cheaper for BP to get its brand on major museums and theaters – just £375,000 a year for each institution on average – than the cost of a short billboard campaign. “We know now that BP sponsorship comes with strings attached,” the letter says. Earlier this year, BP ended its 26-year sponsorship of the Tate and its 34-year sponsorship of the Edinburgh International Festival, blaming the “extremely challenging business environment,” despite years of protests against the deals. Last summer climate activists held a 25-hour protest in the Turbine Hall of the Tate Modern, writing charcoal messages on the floor after a standoff with museum officials. In November, the Liberate Tate campaigners occupied Tate Britain, where they tattooed their skin with the levels of carbon dioxide in the atmosphere during the year of their birth. 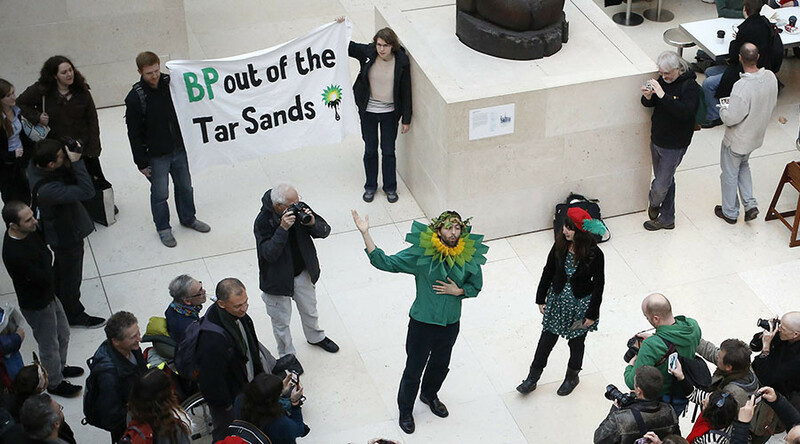 The British Museum, National Portrait Gallery, Royal Opera House and Royal Shakespeare Company have also seen creative demonstrations against their relationships with BP. 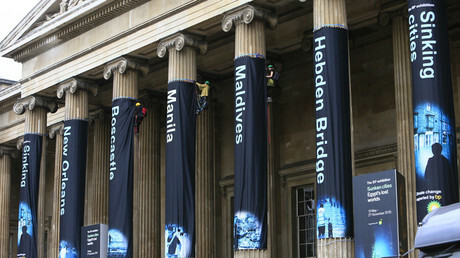 In May, Greenpeace activists scaled the columns of the British Museum in London to protest against BP’s sponsorship of a new ‘Sunken Cities’ exhibition.